Rudy, it's a good thing my mom and I didn't leave last night! They ended up closing sections of the 402 that goes right to the Bluewater Bridge. How is the weather there now?? Hope you have a safe trip home tonight! Oh, and Jeremy and I will definitely take you up on your offer for dinner sometime soon . Thanks!! I heard about the 402 this afternoon--apparently there are around three hundred abandoned cars that got stuck in the blizzard. The ride home was uneventful, although surface streets were still ice-covered. The I-696 freeway was dry most of the way, which surprised me. Even those who lived close to school took forever. My friend says it took her about an hour to get to school, and she is not that far away (8-10 miles). The last half mile took 20 minutes! I had to drive up to Auburn Hills to pick up a DSL modem I found on Craigslist. The freeways here were OK, but once you got up near Pontiac, it deteriorated, and there was more of the hard-packed ice/snow on the roads. On the southbound side they had an accident where someone ran into the median barrier, but otherwise I white-knuckled it back to our area. It really surprises me that your area got so much snow, where we've only had a relatively small amount. Our area was downgraded from 6-10 inches to merely an inch. Boo! I was looking forward to being snowed in and having a convenient excuse not to leave the house for a week. I'm Dreaming of a White (day after) Christmas! Chloe standing on the back deck. 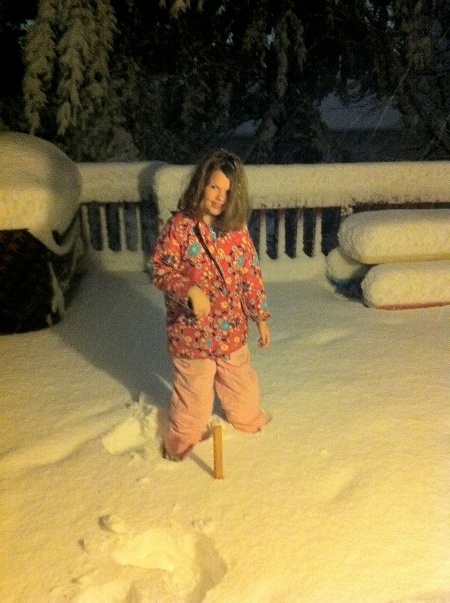 Ten inches so far! 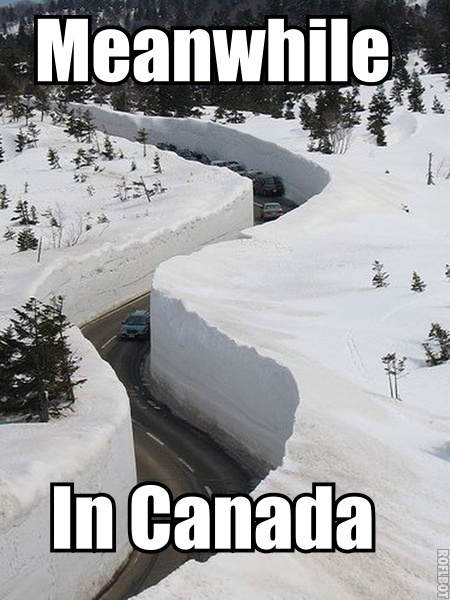 However, it should be noted that when you post snow pictures, we Canadians are VERY tough to impress. I see that your high temperature will be above freezing tomorrow. Neat! Here, we had a good thaw on Dec. 31 / Jan. 1. Since then (yes, nearly one month) we have had a total of ONE day where the high temperature has gone above the freezing mark (for about 6 hours). The rest of the time, our high temperature hasn't exceeded -3°C. I'd imagine our average for January is somewhere around -10°C. Low to mid 60's here, great biking weather. We might take a light windbreaker. *sigh* It's snowing...again. I'm ready for spring!! Needless to say, it has just begun snowing here also. Our forecast, though, has already been scaled back slightly, only 7 to 11 inches of snow as opposed to more, and the blizzard warning expires at 8am as opposed to its original 3pm tomorrow. We shall see what comes of it.